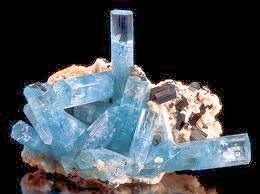 There are many myths and legends about the aquamarine stone. The Romans believed that if the figure of a frog were carved on an aquamarine, it served to reconcile enemies and make them friends. Another Roman legend stated that the stone absorbs the atmosphere of young love: “When blessed and worn, it joins in love, and does great things.” Aquamarine was also considered the most appropriate morning gift to give to a bride by her groom following the consummation of their marriage. The Greeks and the Romans knew the aquamarine as the sailor’s gem, ensuring the safe and prosperous passage across stormy seas. In Medieval times, the stone was thought to reawaken the love of married couples. It was also believed to render soldiers invincible.